The PR1000 is a home gym equipment created by Bowflex. It grants you the ability to perform a large variety of ﻿exe﻿rcises without having to leave your home. This is great for self-motivated individuals who do not want to spend money on gym memberships or simply want to supplement their regular routine. Furthermore, the PR1000 substitutes the need for traditional weight plates and lends itself to be a space efficient product. Detailed description of this item and its usage is presented below. The following Pro and Con section consists of general comments from owners of the PR1000. MMA Life personal experience with the Bowflex equipment follows subsequently to it. The rest of the content is a personal review of the PR1000 from an individual with intermediate level of weightlifting experience. Assembly: The PR1000 is designed so it can be built by oneself, but it definitely does not hurt if you have someone else present to offer a helping hand. It is also useful if you have access to wrenches and screw drivers. If you are putting it together by yourself and following the directions, it should not take more than 1-2 hours to complete. Foldable Design: The image below shows what the PR1000 looks like after being folded up. This feature is great for saving space and makes it easier to store the PR1000 away. 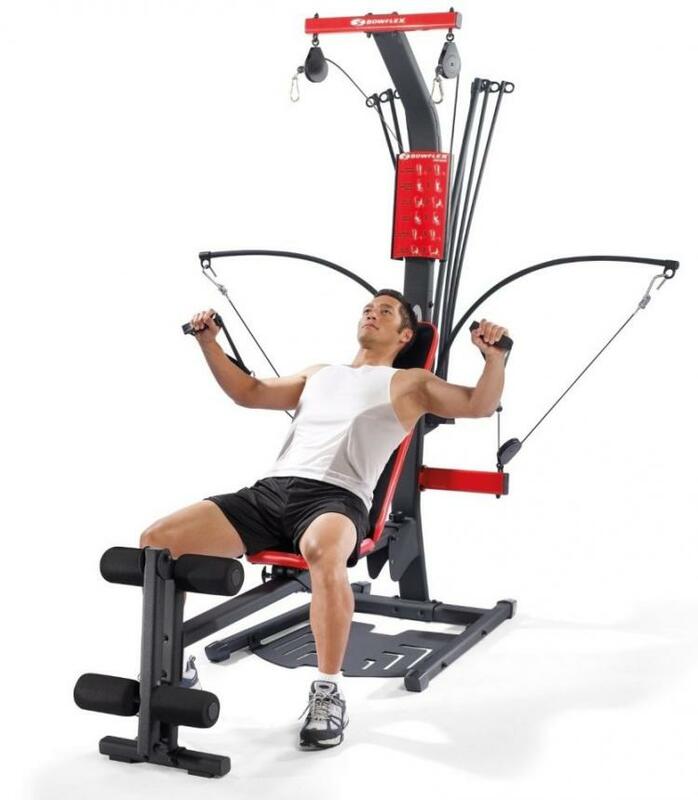 Lightweight Structure: Bowflex created the structure of the PR1000 out of strong but lightweight materials. Adjustable Seats: The seats of the PR1000 are adjustable and gives its user the option to perform exercises while lying down or sitting up. 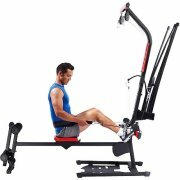 Rowing Seat Rail: The Bowflex has a long metal rail for performing rowing workouts. To transform the Bowflex for rowing exercises, all you need to do is remove the back support structure, free up the seat pin, and attach handles to the pulley system’s bottom attachments. 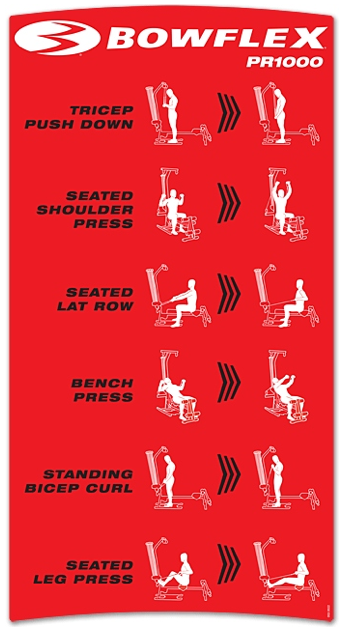 Exercise Chart: A section of the PR1000 is dedicated to holding an exercise chart that illustrates simple workouts that can be perform on it. Cable Pulley System: The mechanism of the PR1000 relies on a cable pulley system and “power rods.” The pulley system has two pair of attachment points for the grip handles. Power Rods: These rubber tubing rods are an alternative solution to the traditional weight plates seen at most gyms. The max resistance level of the PR1000 power rods is 210 lbs. 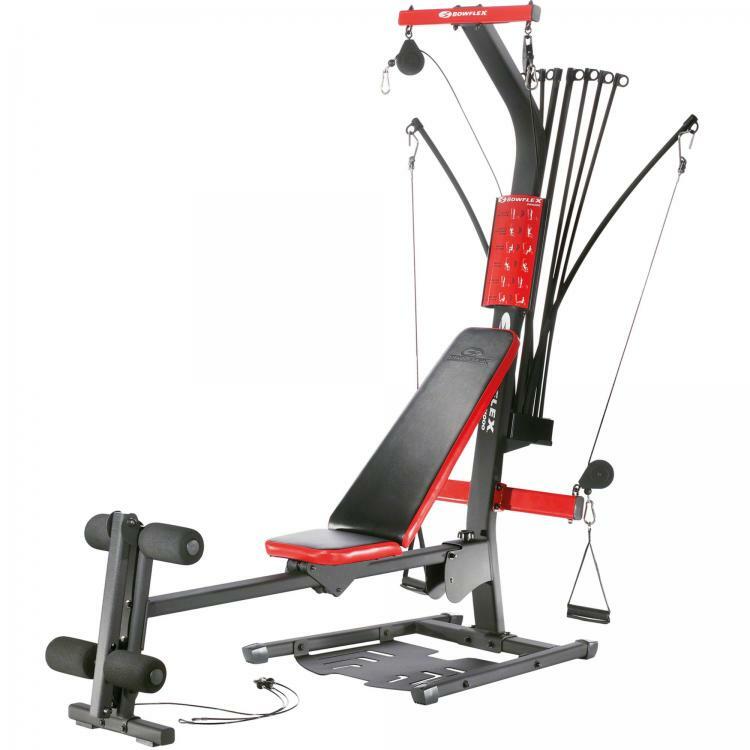 Unlike other Bowflex models, this PR1000 is not designed to have 310 lbs of resistance. Handles: The handles for the PR1000 have a rubber exterior. A strong nylon material loops through the handle and connects to a metal D-ring. To attach the handles properly to the PR1000 pulley system, simply clip the D-ring portion to the pulley system’s carabiner. Roller Cushion: At the opposite end of the power rods is the PR1000 leg extension workout section. Bowflex has soft roller cushions that makes it comfortable to perform these workouts. After I finished assembling the PR1000, I was concerned about the sturdiness and overall durability of its lightweight frame. However, the structure of the Bowflex PR1000 and all of its main components have held up well so far. There are currently no visible signs of cracking or breaking. The only major sign of usage is how the power rods become more bowed over time. Replacement power rods are available online. 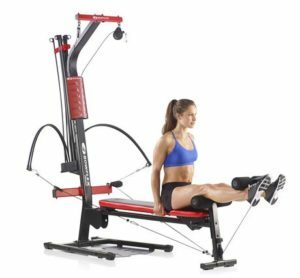 The Bowflex PR1000 design does a really good job of making it possible to perform many of the same exercises available with your local gym equipment. It is a great tool for building strength and conditioning your muscles as its pulley system and power rods provide tensions throughout the exercise motion. Adjusting the power rod’s resistance level is quick and easy. All you have to do is loop the metal hook attached to the end of the pulley cable through the holes of the power rods you want. To increase the level of resistance, hook multiple rods together. The PR1000 is fantastic for upper body workouts and has some decent options for lower body exercises as well. 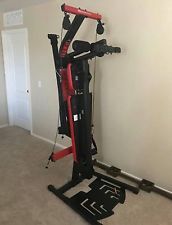 Can The Bowflex PR1000 Be Upgraded? The 210 lbs resistance should be enough for a wide spectrum of experienced weight lifters. If 210 lbs does not present enough of a challenge, try to increase the difficulty of the exercise by performing the motion in a slow and controlled manner. Many people experienced weight-lifters may wonder if the PR1000 is upgradable. The answer sadly is no. However, the Bowflex does offer a similar machine that is upgradable. For powerful weightlifters, different models of Bowflex can be upgraded to have the 310 lbs of resistance (the PR3000). Again, if you are not a competitive weight-lifter, the PR1000 should more than suffice for your weight-lifting needs. The PR1000 is an all-in-one solution that allows for more than 30 different exercises. It should be recommended to individuals who struggle to find the time to commute to a gym or simply wants to supplement their regular routine. 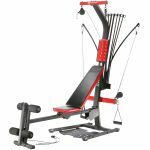 Avid weightlifters should check out other Bowflex home gym equipment models as well since they permit the max resistance level to be upgraded to 310 lbs. However, there are videos online that shows how to modify the PR1000 to obtain this same level of resistance by buying rod addons. The PR1000 cable component is excellent for working out stabilization muscles that may not be as activated with free weight exercises, since the cables provide constant tension throughout each movement. To upgrade your Bowflex experience, you could buy a lat bar and incorporate it into your routine. If you enjoy this Bowflex equipment and want to expand your exercise routine to involve free weights as well, try checking out Bowflex’s adjustable dumbbells.